Atomic Sourpuss: A Godawful Small Affair: Two "The Man Who Sold The World"
A Godawful Small Affair: Two "The Man Who Sold The World"
Upping the sci-fi content and introducing a more familiar sound, thanks largely to the assemblage of much of the sonic staff that would help shape the next three albums (Ronson, Woodmansey, Visconti), "The Man Who Sold The World" is a quantum leap towards the guitar-fellating glam icon that would be unleashed a couple of years hence. 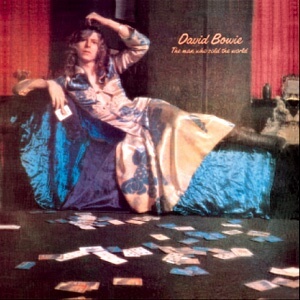 "The Man Who Sold The World" features such future-beckoning tracks as "All The Madmen", which can be seen as the genesis of the theme of insanity running through some of DB's lyrics - those voices will be back on some of them, too - "Width Of A Circle", the eight-minute opener that admirably manages to stay interesting throughout, and "Saviour Machine", which is nuts. One of the other good things about "The Man Who Sold The World" is the fact that its title ("The Man Who Sold The World", as you will remember) is six letters long; this really helps when you want to write about "The Man Who Sold The World", but can't think of much to say about "The Man Who Sold The World" except for '"The Man Who Sold The World" is quite good, and thus I quite like "The Man Who Sold The World"'. But without wishing to be accused of oversimplification, "The Man Who Sold The World" is the standout track (I'm being serious now). With the narrator sounding by turns alien and all too human, that there guitar hook and bags of melancholy beauty, it's no wonder Kurt Cobain nicked it. For a few years I couldn't listen to it when I noticed a really annoying percussion sound too high in the mix; I think it's one of those things where you run a drumstick along a wooden comb-type thing that looks a bit like an alligator - a "Güiro", apparently - but it bugged the living hell out of me. I am a calmer person now and nobody was maimed during this latest playthrough. Join us next time for thrills, spills and... Bob Dylan? Pah. Just don't mention "Kooks".